part of the Washington, DC metro, but can be developed for most counties/areas across the U.S. 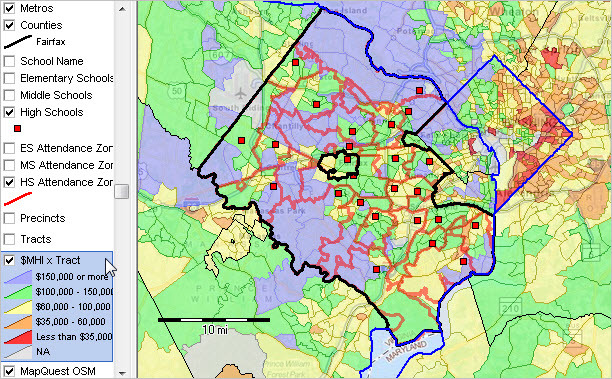 The following view uses the Fairfax County GIS project to examine voting districts (black boundaries) in context of neighborhood economic prosperity. The current vintage VTD shapefile (213 VTDs) was obtained from the County. This view shows median household income by census tract. Using the GIS layer editor, different types of demographic-economic subject matter (such as educational attainment, housing value, language spoken at home …) could be used. As of Census 2010, there were 177,808 VTDs covering the U.S. 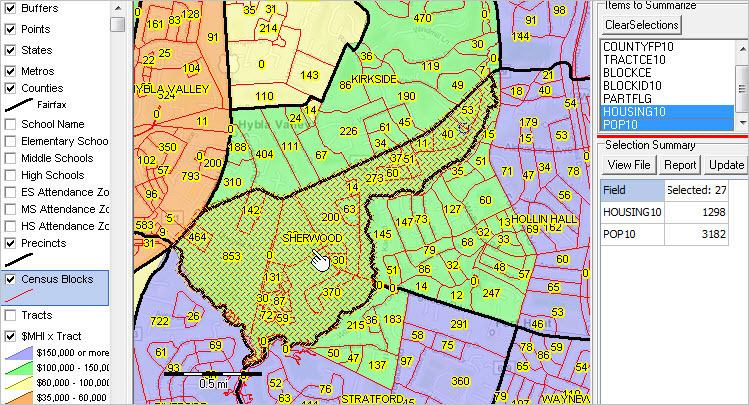 While shapefiles for Census 2010 vintage VTDs are available as a part of the TIGER geographic database, most of these areas have now been updated owing to redistricting and the 2012 and 2014 elections. VTD boundaries can change frequently. While Census 2010 demographic data were tabulated for Census 2010 VTDs, these demographics of less interest to analyzing post-redistricting scenarios due to the changing VTD geography. 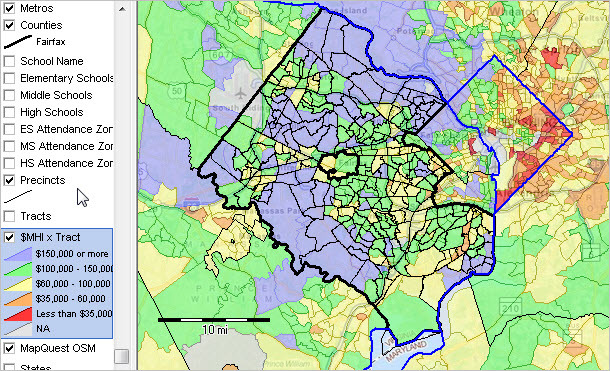 The following view uses the same Fairfax County GIS project to examine census block demographics by voting district. The graphic shows a zoom-in view focused on the Sherwood VTD in southeast Fairfax County. Using the CV XE GIS site analysis tool, all census blocks are selected within the Sherwood VTD (cross-hatched). A subset of blocks could have been selected to examine just part of the VTD. The table to the right of the map shows the aggregated total population and housing units for this VTD. As of Census 2010 there were 1,380 population in this VTD. Other demographic attributes, such as population by age, gender, or race/origin could be integrated into the shapefile using data sourced from Census 2010 Summary File 1. There are 27 census blocks that comprise the Sherwood VTD. Using the View File button in the above operation, these 27 census block records can be viewed using the CV XE GIS dBrowser tool. A partial view of the records is shown below. This file can be exported for use with other software. Using the GIS project, the attendance zone and schools layers can be checked/shown. School locations can be examined by VTD; VTDs intersecting attendance zones can be examined. What VTDs are relevant to which schools/attendance zones? What is the demographic composition of these VTDs? The following view shows high schools (red markers) and high school attendance zones (red boundaries). Note in the legend to the left of map view, that different types of schools and attendance zones can be viewed in wide-ranging combinations. Other types of geography can be added to the mix such as voting districts. The VTD/precincts layer is not shown in the following view so that the view of schools and attendance zones is not obstructed. It can be added to the view by clicking the checkbox by the Precincts layer in the legend panel to the left of the map view. In May 2015, the Supreme Court agreed to consider redefining ‘one-person, one-vote’ principle. See USATODAY story. How might this ruling impact election precinct geography? Issues to be examined in upcoming sections include determining the size of the voting age population by VTD and the size of the citizen voting age population. These attributes could be examined at the block group level of geography, not reviewed here. See additional information on the citizen voting age population. .. demographic-economic characteristics of ZIP code areas (ZCAs) are popular for many reasons. Businesses use ZCAs to examine sales patterns and market and sales territories and for planning and analysis; many client/sales related data may only be available by ZIP code. Analysts seek to knit together these business data with broader demographic-economic characteristics of the area/market — as reviewed here. Where are areas of missed opportunity relative to the size of the market? How is one or a group of ZIP code areas changing, and why? How might change impact you? 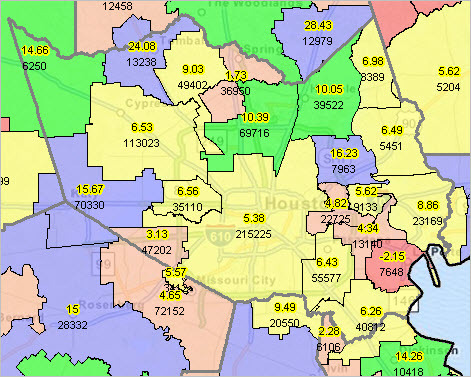 This section provides an illustrative ZIP code area demographic-economic profile and reviews how you can create similar profiles, and datasets for linking your data and further analysis, for any ZCA. 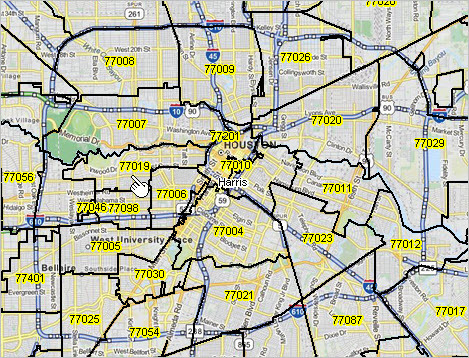 ZIP code 77019, located in the Houston area, is used for illustration. The demographic-economic data/analyses reviewed here were generated using the ProximityOne Outlook2020 software. See that Web section for details about sources, scope and uses of data. Outlook2020 can be used to create these profiles and data extracts for any ZIP code area and many other types of geography. ZIP code 77019 is shown at pointer. … view created using CV XE GIS. 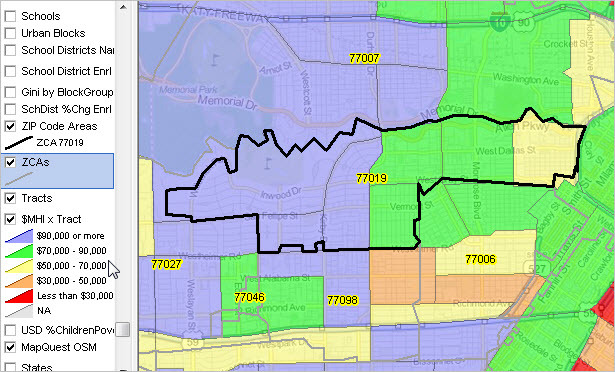 ZIP code 77019 is shown with bold black boundary. The thematic pattern map shows median household income by census tract. Outlook2020 can be used to create a profile for ZCA 77019 (or any ZCA) as well as intersecting census tracts (shown in above view). The two following graphics present a partial view of the ZCA 77019 demographic-economic profile. It is easy to see columns of estimates for two years and their change. The basic profile includes approximately 170 demographic-economic characteristics. See the full profile in this related Web section. 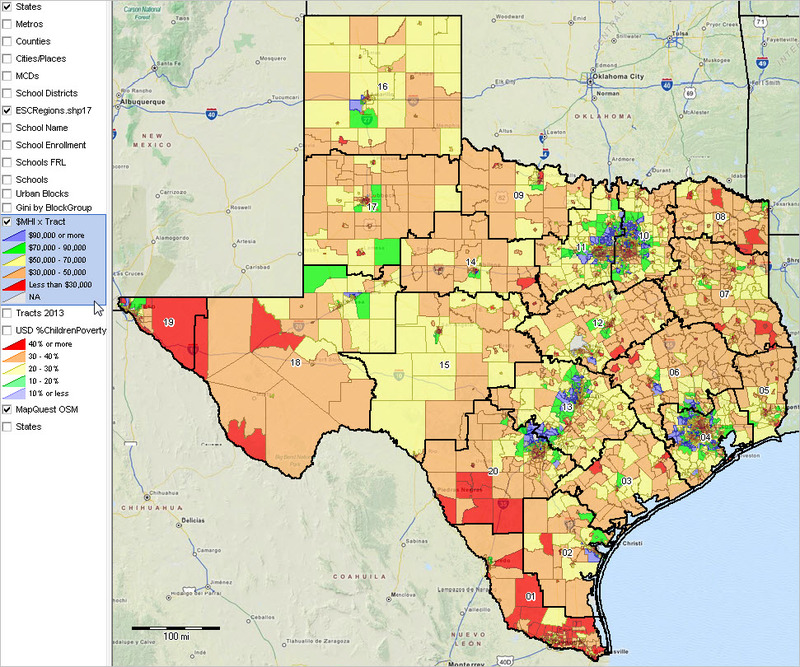 .. examining how Texas school districts are changing … use the interactive table in this section to examine patterns of Texas school district 2010-11 enrollment by grade, 2014-15 enrollment by grade and change over the 5 year period. Use the interactive table to view, rank, compare and query among school districts of interest. Optionally, examine only those districts in selected regions of interest. Use GIS resources reviewed in this section to create pattern maps to facilitate planning and decision-making. Knit these information resources together with related data for more comprehensive insights. See this Excel profile for Frisco ISD showing demographic-economic characteristics and trends for the district. Create your own profile for a district, sub-district area or other geography. The following map graphic shows a thematic pattern view of median household income by census tract based on ACS 2013 5-year estimates. Black boundaries show Education Service Center (ESC) areas with ESC code as label. Use the associated Geographic Information System (GIS) project to develop drill-down views for areas of interest. Knit together enrollment by grade by school district with other wide-ranging demographic-economic data. View communities/cities in context of school districts. 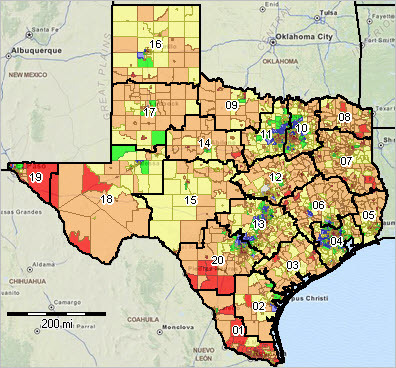 Examine patterns or urban/rural geography by census blocks within one school district or a region. Add your own data. Contact us for more information. 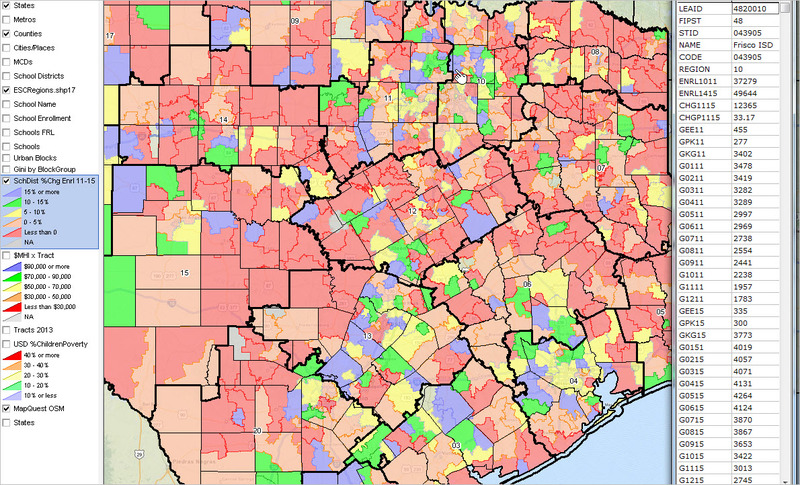 Mention ‘Texas school district GIS’ in the text section. … Click graphic for larger view with legend and more details. … View developed using CV XE GIS. Map your own districts of interest. Click graphic for larger view with legend and more details. See profile for Frisco ISD in larger view (Frisco at pointer in map). Use the GIS project to profile/label any district. 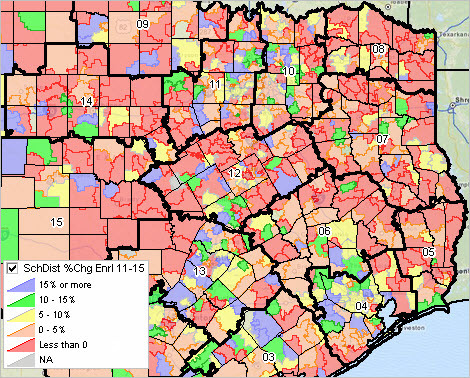 District labeled with enrollment percent change 2010-11 to 2014-15 (upper label) and 2014-15 enrollment (lower label). Counties shown with bold gray boundary. The following graphics show characteristics of the largest and fastest growing LEAs. These graphics have been developed using the interactive table shown below. Use the table to develop similar views by ESC region. This graphic shows districts — having 2014-15 enrollment of 10,000 or more — ranked in descending order on enrollment percent change 2010-11 to 2014-15. View different sets of districts by setting the enrollment threhhold (below interactive table) to a different value. The value 0 includes all districts (also the set shown when ShowAll button is clicked. Use the interactive table and get more details in this related Web section.